A delegation of the new World Baseball Softball Confederation (WBSC) presented their unified vision for the inclusion of baseball and softball in the 2020 Olympic Games to the IOC’s Olympic Programme Commission last week. Besides co-presidents Don Porter and Riccardo Fraccari and others two athletes were on hand as well to speak up on their behalf. Maria Soto (34) was the team captain for the Venezuelan Women’s Softball National Team at the 2008 Olympics in Beijing. “We all believe in the power of sport to shape lives and shape the world – that is why we are all here today. I can tell you from my personal experience that sport offered me more than simply a game to play; it offered lessons for life. Softball is ideal for young women, and that is reflected in its global popularity. I have been fortunate to play for my national team in dozens of games and tournaments around the world, including Beijing 2008. My reason for being here today is to first thank you for this opportunity, and second, to tell you that there is no better way to assist in the development of young women than through sport, and there is no better way to celebrate that accomplishment than by participating in the Olympic Games. 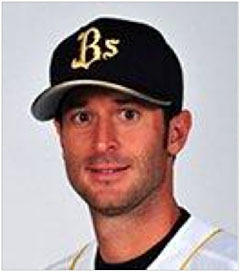 Alessandro Maestri (27) is a current member of the Italian Men’s Baseball National Team. He has played in the United States, Latin America, Australia, Italy and Japan. He is currently under contract with the Orix Buffaloes in Nippon Professional Baseball. “As a kid, I loved baseball because everyone on the team got a chance to score – I know that sounds simplistic, but to a young person, a sport where everyone has a chance to score sounded fun. Another important factor for me was that athletes of all sizes could be successful in baseball. In Italy, I had the opportunity to start playing organized baseball at the youth level, and then I trained with knowledgeable coaches organized by the Italian Federation where I was able to practice my sport under the proper supervision; this type of athlete support was fundamental to my development. As a result, I represented Italy in the 2006 and 2009 World Baseball Classics, and, I have been fortunate to play at the professional level in three countries on three continents.